May 15, 2014 – Ali here, from Gimme Some Oven! Warm weather has finally arrived (or is at least on the horizon), and my neighbors and friends seem to be celebrating everywhere by cracking open some nice cold beers. But when it comes to a delicious brew, why not drink and eat it too?? Without a doubt, one of my favorite uses for leftover bottles of beer is to whip up a batch of quick beer bread. And when I say quick, I mean quick. You can literally whip up the dough for a batch of beer bread in about 5 minutes and then pop it in the oven and have a warm, comforting and delicious loaf ready to go in less than an hour. It’s the perfect quick bread to enjoy year-round! 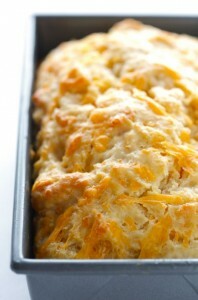 And speaking of perfect, I’m pretty sure that this garlic-cheddar beer bread is as good as it gets. Lately, I have become a big fan of the Monterrey Cerveza beer from ALDI, a pale lager which is amazing to cook with as well as drink. So I decided to give it a try in this bread, along with a generous handful of shredded extra-sharp cheddar cheese and garlic. And the result was beer bread perfection. It’s savory, buttery, cheesy, mildly garlicky and crazy good. I made a double batch to share with some friends, and they all agreed! I always say that when it comes to cooking with beer, you should only (please!) cook with beers that you would happily drink. And this brew from ALDI fits the bill. It’s just as delicious in a frosted cold glass as it is as a marinade, sauces, beer cheese soup, braising liquids, and of course, the always-popular beer bread. Just be sure that your beer is room temperature for this recipe, and also keep in mind that — contrary to popular belief — only about half of the alcohol will bake out. So pick up a 6-pack of beer at your local ALDI, and see for yourself how delicious it is to “eat” as well as drink. Enjoy! Photos by Ali Ebright for Gimme Some Oven. I’ve been making my own beer bread for years. Sorry, Tastefully Simple, but your mixes are TOO EXPENSIVE and when I make it myself it tastes EXACTLY the same! I’ll have to give this version a try!! This is going to my to-make list for this weekend! Gorgeous bread! Aldi products. Don’t make beer to much work in old age. I grew up in Wisconsin so beer and cheese were staples at home. I made a beer bread years ago and have lost the recipe, forgetting how good it was. This is basically a quick bread but one with much flavor. I will have to make it soon. Hi, I saw your reply to the garlic beer bread. I want to try making it. Are you saying you can use only the beer, cheese and substitute self rising flour for regular and that’s absolutely it? No sugar, or baking powder, or salt or butter needed? And how much flour? same as the recipe called for, for the all purpose? Sorry, hope it’s not a bother to ask. I have 3 little ones so fast and easy are far much preferred. I also use self rising flour, beer, cheese and bacon. Yum. I’ve made beer bread many times, and I do the same thing. Self-rising flour is so much easier! I do use a little sugar, but I don’t think you need too. I’m not sure why there are so many comments about this recipe not being quick and easy. I threw this together in less than 10 minutes including the time it took to warm the oven and grease the pan. This could not have been easier! I need to make the drop biscuits instead of a loaf. Can you do that with this recipe? Hi Jane – great question! Unfortunately, this Garlic Cheddar Beer Bread recipe works best as a loaf and likely won’t be as successful using drop biscuits. You could try it. I would adjust the racks on the oven so that if you ended up with 2 pans worth they could go in the oven at the same time. I would probably make them bigger too. If the dough is to wet/soft for drop biscuits, you could try putting the dough in a muffin tin if you just want individual bread instead of slices. Cook for less time, and I would try the oven at 375 or 400F to get them ”up” and cooked, like I would do for other biscuits or muffins. I’ve never used a box. Never understood the Pampered Chef concept of packaging the easiest thing in the world to make. My Mom’s recipe from a zillion years ago is 3 C. Self-Rising Flour, 3 T. Sugar and 1 can of beer. I just wisked the additional garlic powder in with my dry ingredients, poured the beer in mixed, then added the cheese and mixed until everything was just incorporated. Put it in a buttered pan and I reserved a little chedder to sprinkle on top. YUM!! Much easier that the above. The self-rising flour has the powder ,etc. in it. This is my new favorite recipe EVER! So easy and the best tasting bread imaginable! This bread is so good. We like to make sandwiches with it. Great with stew. Next batch will add jalopinos. I just made these… they were just OK, nothing to write home about. I subbed jarred minced garlic instead of garlic powder so maybe that is why. I had rave reviews for this bread! Everyone at a surprise party this past weekend LOVED it!! I’ve made this bread a number of times now, and it is SO EASY!! I usually do 1 cup of all purpose flour and 2 cups of whole wheat flour. I also grate a little fresh garlic in to give it an extra kick! I have tried all different kinds of beers, each make the bread unique! So many options for modifications too- extra cheese, jalapenos, bacon, herbs… I love this recipe and how easy it is, and I will keep making it! Thanks for sharing!! Sooooo good. I made this last night to go along with chili. My boyfriend said he could’ve eaten the whole loaf! Not understanding how this recipe is “a lot of work” or even close to being expensive. I always have these ingredients in my home, and threw everything together within 10 minutes. Added roasted garlic, parsley and some grated parmesan to it. Great recipe, I have it in the oven now, it smells awesome. Aldi was certainly a TERRIBLE PLACE TO WORK but they do have great food and recipes! I had trouble with this cooking all the way through. The flavor was amazing and we loved the crust! But, the center was very doughy, even still runny. Next time I am going to try making the mini loaves. Just made this bread, having home made bean soup too:) thanks for this wonderful recipe!! It is June 8th, cool morning for this time of year. My son-in-laws birthday. I’m going to make this delicious bread for him. Since he lives in PA and I live in Canada, I’ll have to eat it myself. The thought that counts. Did you know that it comes great using Bisquck? My bread comes out great my only problem is sticking to the pan, help? Pingback: 6 recetas de pan casero de sabores: ¡para todos los gustos! This was wonderful with our corned beef St Patrick’s Day dinner. I brushed butter with sautéed garlic on the top, mmmm, tjm. Just made the bread 2 hours ago. Love it. This recipe is a winner. Quick and easy and delicious. I’m not changing a thing. Thanks for making my day. We’re glad you enjoyed it Patti! Thanks for reaching out. I am definitely going to try this bread will be using it to compliment a soup for my niece’s wedding.